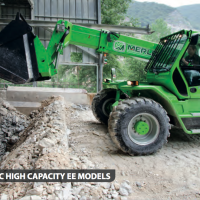 Born in 1987, the Merlo Panoramic series range from 2.8 tonnes to 10 tonnes capacity, and have lift heights between 6 and 18m. High lift and Ultra-high lift ranges mostly feature frame levelling and compact stabilisers for the greatest placing stability and safety . High capacity machines are optimised for semi-industrial use on tyres.